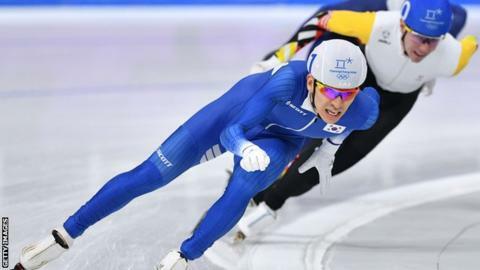 South Korea's Lee Seung-hoon won gold for the home nation in the first men's speed skating mass start event at the Winter Olympics. Belgium's Bart Swings was second while the Netherlands' Koen Verweij came away with the bronze. Dutchman Sven Kramer - the most decorated male speed skater in Olympic history - led with two laps to go but finished last. Seung-hoon also picked up a silver medal in the men's team pursuit. Compatriot Kim Bo-reum won silver in the women's mass start event. However, only the first three athletes to complete the 6,400-metre race win medals regardless of sprint-lap performance - with the points accumulated being used to rank the rest of the field.